Nusberg in November 1967. Photo: Alexander Grigorjev. 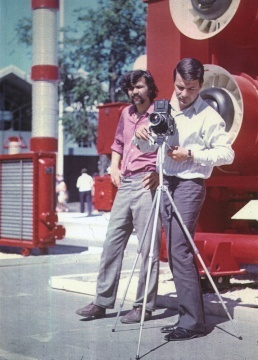 Alexander Grigoriev and Nusberg shooting the exhibition in Sokolniki Park, Moscow, 1971. 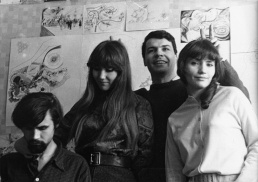 Nusberg, Tatiana Bystrova, and others at his studio, 1971. 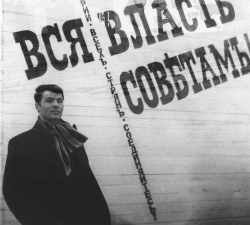 Lev Valdemarovich Nusberg [Лев Вальдемарович Нусберг (Нуссберг)] (1937, Tashkent) is a painter and kinetic artist. 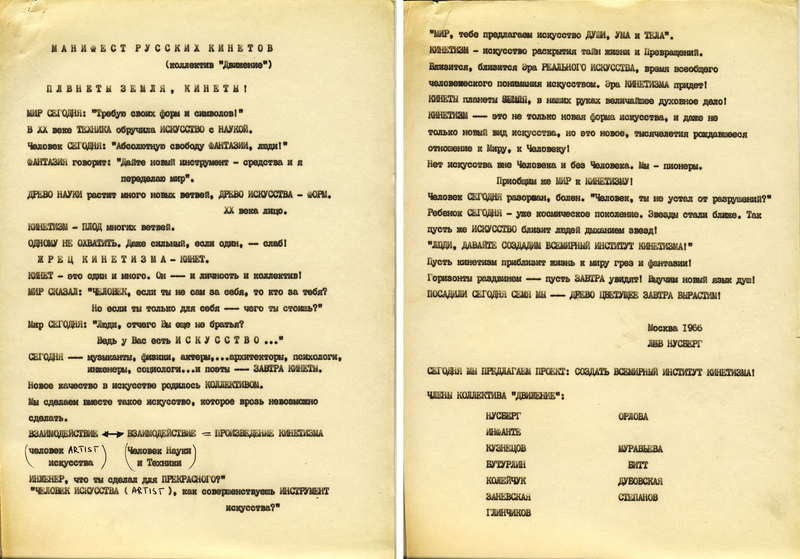 His father Waldemar came from a German family of Nusberg gardeners, subsequently lost aristocratic prefix "von" and the letter "s" from his surname, became an architect, and in 1938 he was convicted for "spying for a foreign power" and disappeared in gulag in Ural. In the late 1940s, Lev with his mother, a singer and a technologist Raisa Bespalova, failed to emigrate to Poland and moved to Leningrad. Nusberg graduated from the Moscow Art School 1905 (MSKhSh, 1951-58). The eye-opening event for him was the Picasso exhibition in Moscow (1956). He formed the Dvizheniye group (1962-78) whose members included Francisco Infante and Viacheslav Koleichuk among others. The aim of the group was to create 'bio-centric' systems called Igrovye Bioniko-Kineticheskie Sistemy [playful bionic-kinetic systems]. A charismatic leader, Nusberg attracted people, but some members of the group (particularly Infante) found his management style 'totalitarian'. He also founded the group Dynamik in Leningrad. 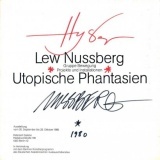 Nusberg emigrated to Germany in 1976. He held a number of exhibitions, in Dusseldorf and Paris (1976), Venice, Netherlands and London (1977), Bochum, Turin, Kassel, New York (1978), and in Bochum (1979). In 1980 he moved to the United States where he lives in Orange, Connecticut, afterwards. He moved from kinetic art to surrealist painting, and keeps rewriting the history of the movement. 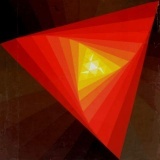 Idolatry, for the project Shore of the Black Sea, 1968, sketch. Валентин Воробьев, "Кинетические игры футуролога Нуссберга", May 1999. Biographical sketch. Russian. This page was last modified on 9 September 2017, at 21:27.